Need less than a pallet? Click here. Save even more on RES Supply's every day low Solaria prices by purchasing a pallet. Or purchase multiple pallets to take advantage of our low $149 flat rate shipping. If you need assistance selecting additional parts for your system, add our design service – free with a full system purchase. We can even help with the permit process when you order one of our permit packages. Our great service combined with the low price on the PowerXT-350R-AC-PT Pallet is a value that can't be beat. The Solaria PowerXT AC Module combines the latest cutting-edge microinverter technology from Enphase with the premium high-efficiency and superior aesthetics of the Solaria PowerXT Module. Utilizing the latest Enphase IQ7+ platform, the PowerXT-350R-AC-PT Pallet puts aesthetics and performance together into an elegant user-friendly package that reduces installation time by combining the inverter, module and monitoring. Achieving up to 20% efficiency, Solaria PowerXT solar modules are one of the highest power AC modules in the residential solar market. Compared to conventional modules, Solaria PowerXT modules have fewer gaps between the solar cells; this leads to higher power and superior aesthetics. Solaria PowerXT residential modules are manufactured with black backsheet and frames, giving them a striking appearance. Solaria PowerXT modules achieve up to 20% efficiency; conventional modules achieve 15% – 17% efficiency. Combined with Enphase IQ7+ microinverter, the Solaria PowerXT AC Modules-is one of the highest power and most efficient AC modules available. The integrated Enphase IQ7+ microinverter reduces installation costs by taking the complexity and guesswork out of designing systems and combining components in the field. It is also compliant with NEC 2014 & 2017 rapid shutdown requirements. Meets CA Rule 21 and complies with advanced grid support, voltage and frequency ride-through requirements. Remotely updates to respond to changing grid requirements and is configurable for varying grid profiles. 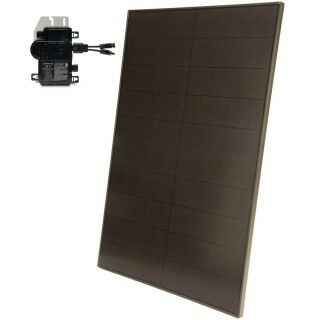 Compared to conventional modules, the Solaria PowerXT AC Module has a more uniform appearance and improved aesthetics. Industry leading 25 year warranty with a million hours of microinverter testing.